"Literacy is a fundamental human right and the foundation for lifelong learning. It is fully essential to social and human development in its ability to transform lives. For individuals, families, and societies alike, it is an instrument of empowerment to improve one’s health, one’s income, and one’s relationship with the world. The uses of literacy for the exchange of knowledge are constantly evolving, along with advances in technology. From the Internet to text messaging, the ever-wider availability of communication makes for greater social and political participation. A literate community is a dynamic community, one that exchanges ideas and engages in debate. Illiteracy, however, is an obstacle to a better quality of life, and can even breed exclusion and violence. 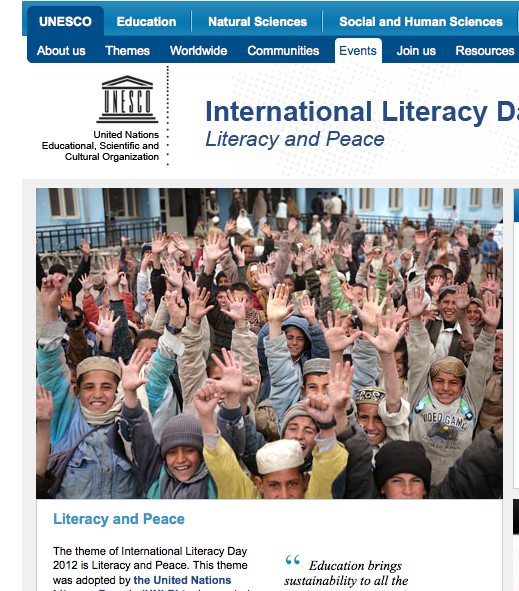 For over 65 years UNESCO has worked to ensure that literacy remains a priority on national and international agendas. Through its formal and non-formal literacy programmes worldwide, the Organization works to realize the vision of a literate world for all." 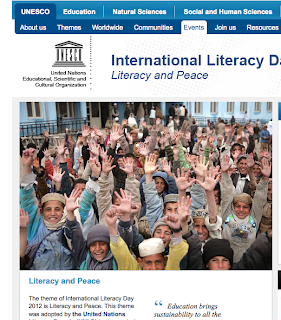 International Literacy Day is a project of the United Nations Educational, Scientific and Cultural Organization. You can find out more here. I love how they're talking about literacy as a means of empowerment. I think that is so true, especially when you pair literacy with books that show people whose voices and experiences have previously been silenced. This falls under the category of helping make the world a better place. To quote Robert McKee: Stories are equipment for living.